It's normal to be overwhelmed by Wildfire at first sight. Standing at 183.8 feet tall with a first drop of 160.8 feet at a stomach-churning 83 degrees, amidst the thick layer of trees mountainous terrain, Wildfire is a majestic sight to see that makes to-be riders having second thoughts. Point-of-View Video for Wildfire can be seen here. Wildfire's stomach-churning 160+ feet first drop, measured at 83 degrees. Having heard such rave reviews of roller coasters created and produced by Rocky Mountain Construction (RMC), I was very excited to review this roller coaster because I hadn't had the chance to ride any of their rides. What makes Wildfire at Kolmårdens Djurpark unique is that this is the 1st RMC coaster to open in Europe. 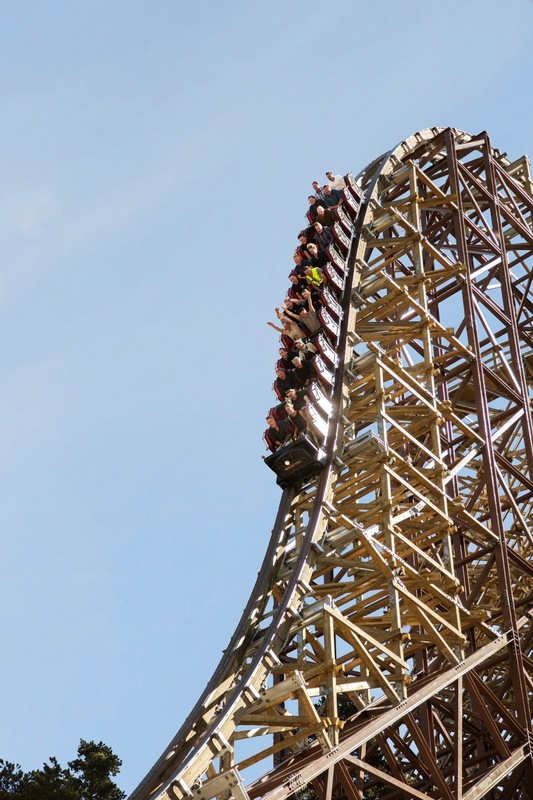 Known for restoring old wooden roller coasters into an airtime-assault steel machines in the U.S. (see New Texas Giant, Twisted Colossus, and Iron Rattler), RMC brought a huge wave of excitement when Wildfire was announced in 2014; not only was it one of the few RMC coasters to be created from scratch - the others being Outlaw Run, Goliath, and Lightning Rod -, but also because of the odd location of the coaster: a zoo. If you happen to pass by this entrance, you wouldn't have noticed that there's actually one of the world's greatest roller coasters in this zoo. Yeap. The world's 2nd tallest and 3rd fastest wooden roller coaster is located in a zoo, not a theme park. Wildfire is located at the very back of the zoo, within the vicinity of the Marine World. Due to its location at the back corner, visitors are unable to see the roller coaster from the entrance (there's only 1 entrance). In fact, due to the mountainous terrains and thick layers of trees throughout the park, Wildfire can't be seen until visitors actually arrive at the Marine World section itself. Wildfire is located at the very - VERY - back corner of the park. It normally takes 20-25 minutes for visitors to walk there from the entrance. One more thing to note is the size of the zoo. This is not your typical get-everything-done-in-one-day zoo. Kolmårdens Djurpark is the largest zoo I've ever visited. The sheer distance between the entrance and the roller coaster, the tricky-to-navigate layout of the zoo, and the challenging terrain make walking to Wildfire an exciting journey on itself. Visitors should prepare at least 20 minutes to walk from entrance to Wildfire (also the duration it took me on an average pace). Wildfire's first lift hill and main station, complete with an antique fire truck as a theming. The ride, having been opened for only 2 months, have not drawn massive crowd. During my visit, the queue was 10 minutes throughout the day. Good news for me since I was able to re-ride for around... 10 times. Wildfire is themed to a man-made disaster of the same name. Way to go to promote environmental awareness, Kolmården! The entrance and the station of the coaster are rather discreet for a roller coaster of such majesty, status, and size. On the final staircase to the station, riders are given a glimpse of what's to come: this massive first hill. One thing that I noticed right away as I did my restraints was how heavy duty the lap bars are. Unlike typical lap bars that you can find on other normal wooden coasters, the ones on Wildfire are HUMONGOUS and heavily padded. In addition, they have extra secure railings to keep both of your legs in place. Perhaps this is because the roller coaster goes upside down 3 times. Wildfire's main station and the train. Notice how heavily padded the lap bars are. Wildfire starts with a tight right turn to the massive first hill, where riders are taken to the top of the 183.8 feet tall hill. Afterwards, the train dips slightly followed by a 270 degrees right turn, a bump up, and then... one of the best first drops of any coasters in the world! Me conquering Wildfire as my 300th roller coaster. The sensation is a pure ecstasy of danger, excitement, fear, and fun! Those who sit at the back will be completely thrown out of their seats as the train crests up the small bump before the first drop, only to be smashed down at full force before they even finish the bump. Following the first drop is the so-called Inverted Zero G Stall, an element that RMC is widely known for. I had never experienced an element like this, so I didn't know what to expect. I loved how crazy this part is! After the first drop, the coaster directly sends the riders into what I can say a combination of weightlessness (zero gravity) and upside-down hangtime. Riders experience this weird sensation for probably a full 4-4.5 seconds before going back down. Wildfire blends very well with the surrounding nature: the thick layer of trees, the mountainous terrain, and the bay next to the zoo. Here you can see Wildfire's first hill, first drop, and inverted zero G stall. Afterwards, comes another signature element of RMC, the Outward Bank Tophat. This is an element where riders turn inward but the train faces outward. 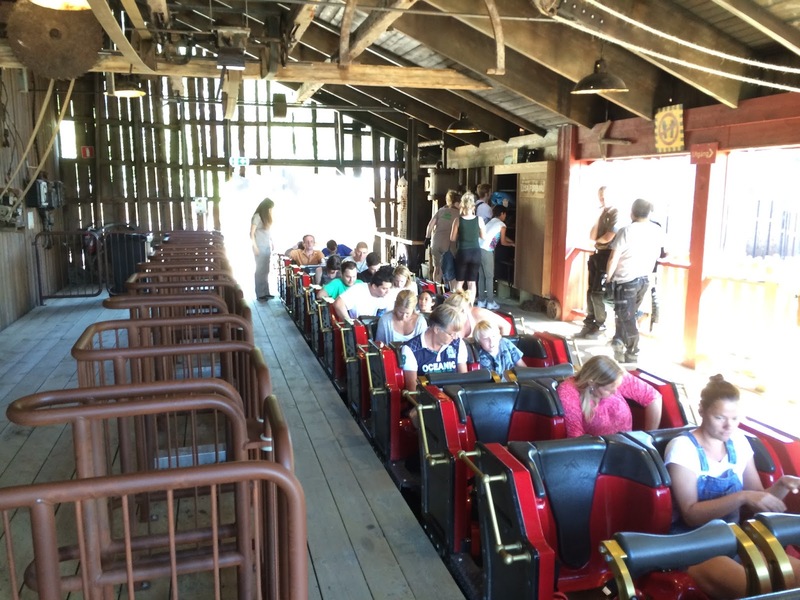 This is yet another insane moment on Wildfire as riders are forced to grasp on their handle bars tightly because they are literally - LITERALLY - thrown out of their seats! What follows the ride from this point on is the speedy journey through the mountainous terrain on which the roller coaster sits. There are floater and airtime hills and there, tight turns, and head-choppers. Then comes the second inversion: a super-smooth Heartline Roll that is surprisingly fun and exciting, despite not looking like it. This is then followed by another Heartline Roll - albeit slower but equally smooth - after another airtime hill and turn. Right before Wildfire ends, the train goes up a small hill right below the first drop and gave the riders a final mini airtime moment before going back down to the bottom terrain, followed by an S-Turn and then the final brakes before going back to the station. Wildfire's outward bank top hat is one of the craziest moments of the roller coaster. 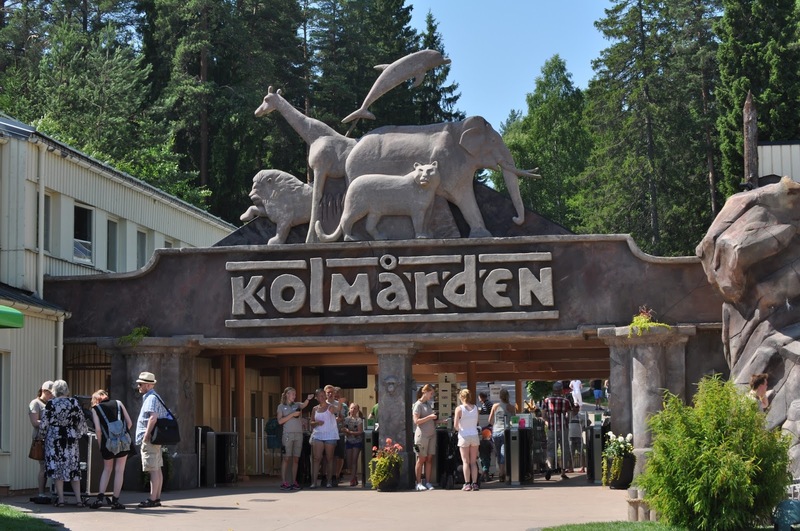 Would I agree with Kolmården's marketing that Wildfire is the world's greatest wooden roller coaster? It's hard to do so, as one's preferences differ from those of others. For me personally, it's not a personal favorite. Despite the one-of-a-kind elements and amazing uses of terrain, Wildfire lacks one thing that my favorite wooden roller coaster, El Toro, has: intensity. Despite the fact that Wildfire goes upside down 3 times, as well as is the world's 2nd tallest and 3rd fastest wooden roller coaster, the roller coaster is not intense enough for me to be a personal favorite. This is particularly apparent through its rather low height restrictions: a mere 120 centimeters. When I paid a visit, approximately 20% of the riders were children below the age of 10 or so. Either I am right - Wildfire is not too intense - or wrong - perhaps Nordic kids are just brave bunch of kiddos! Nevertheless, it is indeed one of the world's greatest wooden roller coasters. This is one of those roller coasters where each element connects perfectly. Transition flows smoothly from one part to another. I also love the fact that the ride manages to divide itself into two main parts: (1) The first part is the one with the height, the WOW factors, and the OMG moments, and (2) The second part is all about speed, quick changes, and zooming through the nature's ground. Overall, Wildfire is in my Top 10 Roller Coasters list. 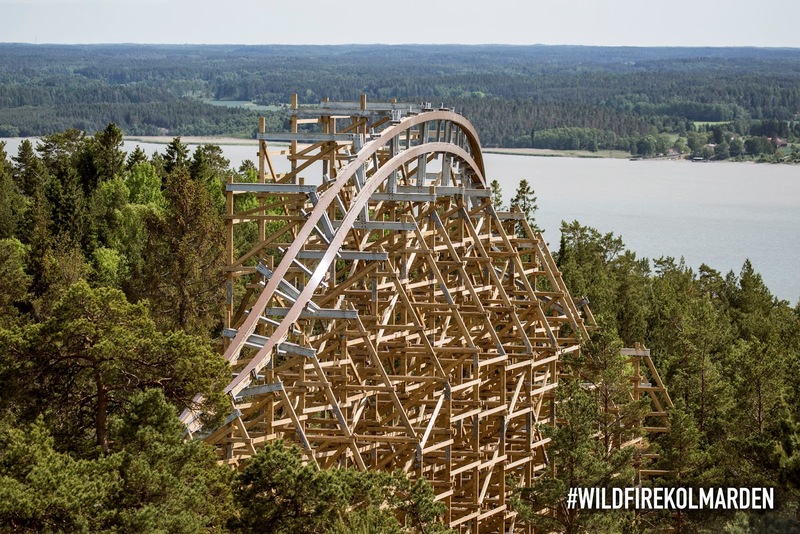 No matter where it will fall in the world ranking, Wildfire is a major hit that would catapult Kolmårdens Djurpark to international level in the near future. It's fast, it's crazy, and it's exciting without abandoning the younger demographics. This is a roller coaster that is worth riding again, and again, and again, until you lose your sense of direction. Fantastic! Thanks for sharing your thoughts!